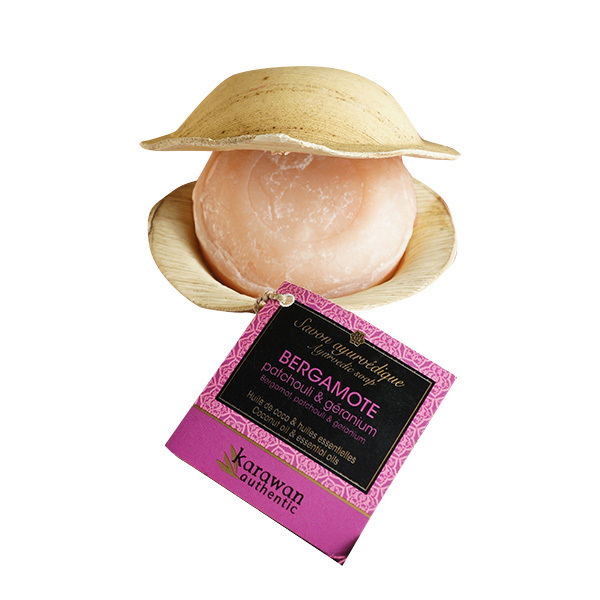 Regenerating Ayurvedic Soap (Bergamot, Geranium and Patchouli) Coconut oil is saponified cold pressed and mixed with vegetable oils and essential oils of plants known for their virtues in the Ayurvedic tradition. - This soap is the result of a partnership formed by Karawan with artisanal production unit with the approval of Indian "Ayurveda" which guarantees the traceability of exclusively natural ingredients. - The recipes are prepared in accordance with the nature of the skin, with a holistic approach to their needs. - This mild soap and plenty creamy foam, it softens sensitive skin or very dry. It is also used as a shampoo. Can also be used as a shampoo. Karawan Authentic brings natural and organic products from the Middle-East to Europe! The company aims to uphold a sustainable fair-trade approach in India, Morocco, Nepal, Syria, Turkey and Vietnam by supporting local craft industries and farming. Karawan Authentic is famous for its Aleppo soap produced in Syria, which has been renowned for millennia for its skin care properties. Karawan soaps only contain carefully selected ingredients such as organic olives and laurel oils. They do not contain any animal fats or chemical additives. As they are exceptionally rich in fatty acids, Aleppo soaps have purifying, soothing and regenerating properties. Karawan Alum stone is another must-have. Used as a deodorant, it is appreciated for its antiseptic and astringent properties. Therefore it is gentle enough to use directly after underarm shaving or waxing. Natural crystal deodorant stones do not irritate your skin: they are completely chemical-free! Enjoy perfect relaxing moments with Karawan wellness and beauty products.